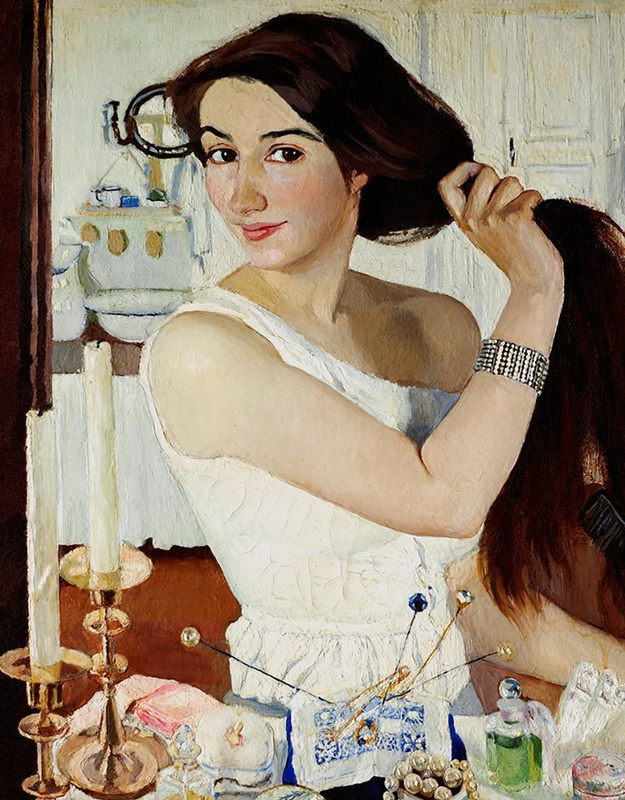 In 1910 self-portrait "Behind the toilet" became the main event of the spring exhibition of the Union of Russian artists in St. Petersburg. 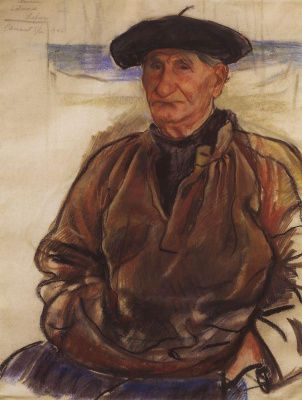 He was surprised not only criticism and the audience, but Alexander Benois uncle Zinaida Serebryakova. How this sweet, shy and uncommunicative girl, instead of active participation in the "art of life" raising children and enjoying a happy family life, was able to make him speak about his work inveterate visitors of art galleries and the artists themselves? Perhaps in the freshness of her perception and it was. From the picture emanates a feeling young, causeless joy, joy "because", and in the process of being. Portrait of a very bright – and on the chosen colors, and mood. 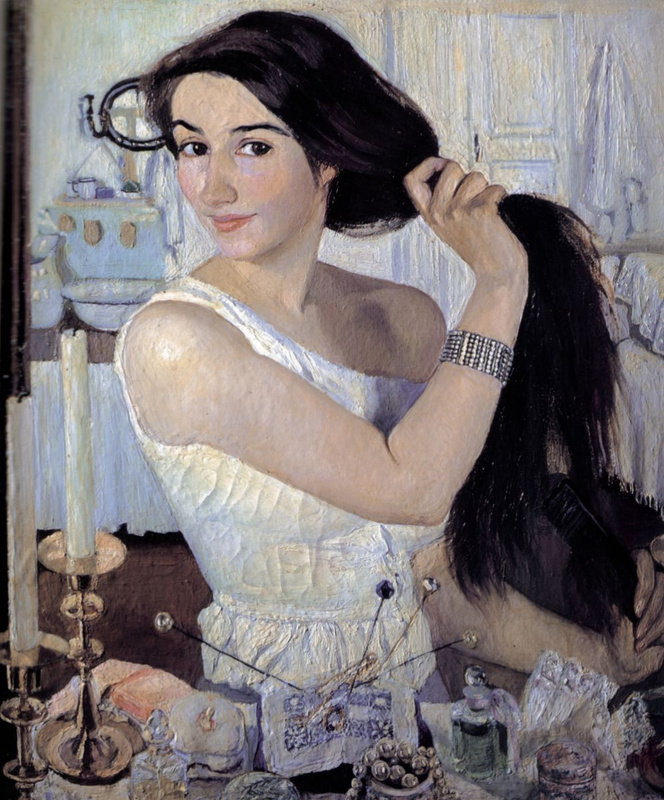 A beautiful, young woman, catching with one hand MOP of thick hair, the other holding a comb which combs them. A few crafty, joyous look as if to say, "How good!" Well all is to be beautiful and young, to feel the weight of hair in hand, to glare, to just live! The mesmerizing picture of cheerfulness and optimism. And Yes, before us is not a self-portrait of the artist, which represent, for example, "Yellow lilies" Natalia Goncharova. 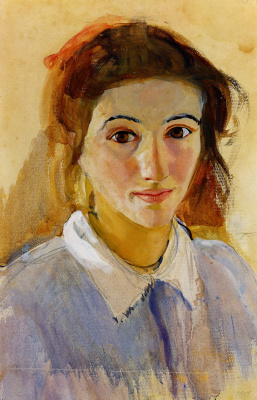 Will be like and Serebryakova – when to write it will not be from excess of happiness and escaping from the world and striving hard to earn money to feed their children. And while the artist has depicted himself among the attributes of female beauty, flasks, bottles, beads, pins. Even a candle before a mirror, the familiar symbol of the secret mysteries and gloomy Affairs, said here about how a young woman in the evenings looking in the mirror, everything is happy all the same. An elongated candle holder comes into rhythmic echoes of the graceful figure of the heroine. By the way, in Self-portrait with a candle" candle shown only in the form of reflections on the heroine's face, too, seems a symbol of warmth and coziness. The famous art historian Dmitry Sarabyanov called the main aesthetic value of this picture of natural beauty. 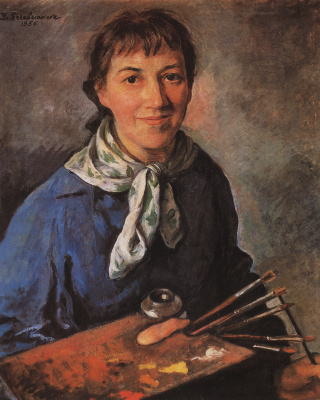 Zinaida Serebriakova spent in that year the winter at the estate of her husband in boring. Boris left for the trip, and she and her children remained on the farm. It snowed a lot, but the house was hot, heated, warm and cozy. 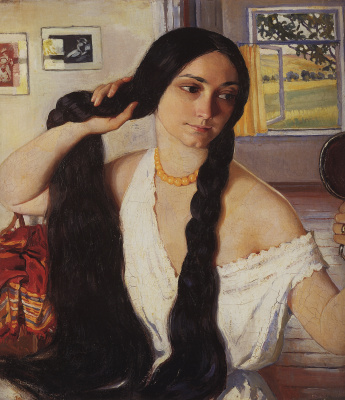 Writer Efim Dorosh draws an analogy between the portrait Serebryakova and Pushkin's Tatiana Larina, meaning not literary image and the poetics of Russian village, the open and shown Pushkin. 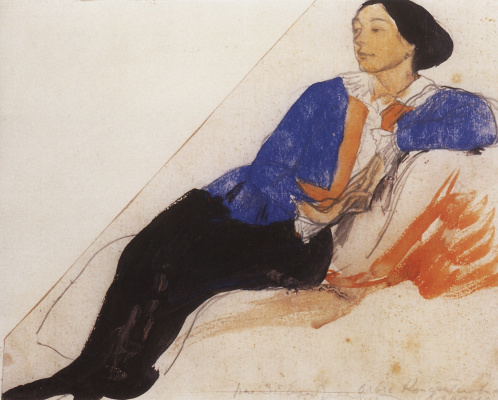 Pushkin, by the way, for life remained a favorite poet Zinaida Serebryakova. 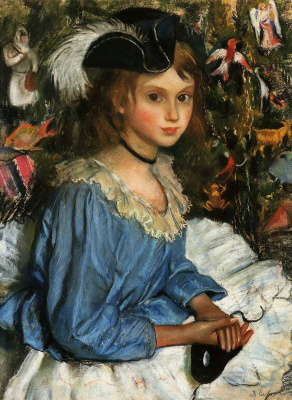 The purity and charm of unspoiled youth also have in common is the heroine of the picture with Tatiana, but the playful joy and delight from the life depicted in the portrait on the order of more than Tatiana Larina. 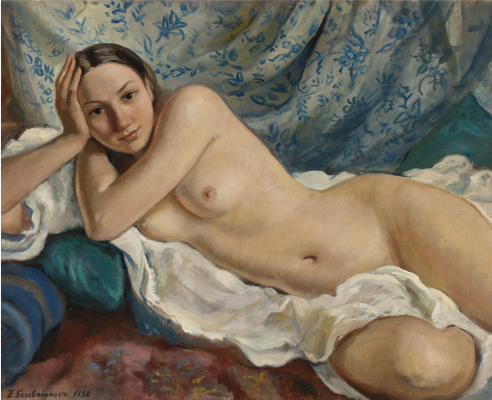 Serebriakova painted himself before the mirror. Implied, but almost invisible to the viewer, it creates a kind of boundary separating the character from the viewer. 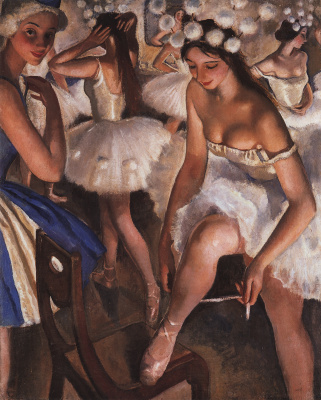 And it allows us to say that, contrary to the conscious attitudes of the artist, completely intolerant of all sorts of revolutionary, avant-garde trends in the arts, she intuitively brought to the picture elements of modernism. Despite the apparent realism of the image created by a mirror and reflect the isolation, the separateness of the model from the world, embodies what Sarabianov called stay at the same time "in the otherworldly and this-worldly reality". 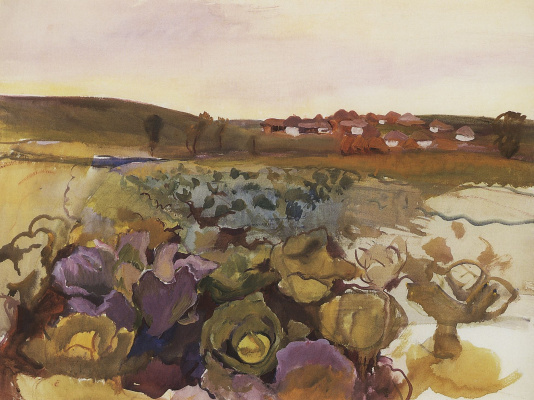 Alexander Benois was also found elements of art Nouveau in the work of her niece, although she herself did not think so. 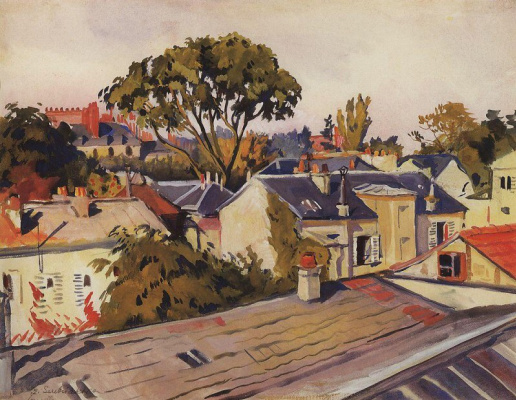 Zinaida Serebriakova, reared on the ideals of "world of art", was "more royalist than the king himself" as a joke someone from their surroundings by comparing artistic views Serebryakova and Benoit.